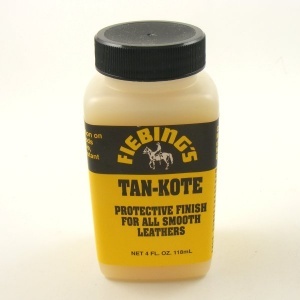 Fiebings Tan Kote gives a protective, moisture resistant surface finish to natural or dyed leathers. Apply evenly with a brush or sponge and leave to dry. You can then add a second coat if you wish. 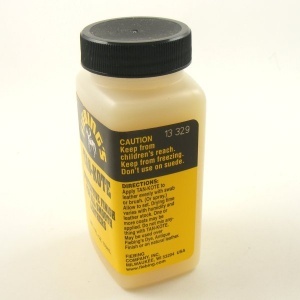 Tan Kote is completely clear when dry, and can be used on any colour of leather. We always recommend trialling products like this on a scrap of leather, or for finished items of leatherwork, to apply to the least visible part first, ie the bottom of a handbag, to be sure that you are happy with the finish before treating the whole item. This is a 118ml bottle.